Stonechat (Saxicola torquata). Summer-plumage male. Taken at Mwnt, Ceredigion, on May 7th 2014. Summer-plumage male. Taken at Mwnt, Ceredigion, on May 7th 2014. Stonechat (Saxicola torquata). Winter-plumage male. Taken at Otmoor, Oxon., on November 30th 2013. Winter-plumage male. Taken at Otmoor, Oxon., on November 30th 2013. Stonechat (Saxicola torquata). Female. Taken at Otmoor, Oxon., on November 3rd 2013. Female. Taken at Otmoor, Oxon., on November 3rd 2013. Stonechats are small Robin-sized birds. Males have striking black heads with white around the side of their neck, orange-red breasts and a mottled brown back. Females lack the male's black head, but have brown backs and an orange tinge to their chests. There are two European subspecies, rubicola in southern and eastern Europe, and hibernans in western Europe and the UK. They are found on the southern and western coasts of Britian and Ireland, and in northern England and Scotland in the summer. Birds over-winter in southern England. 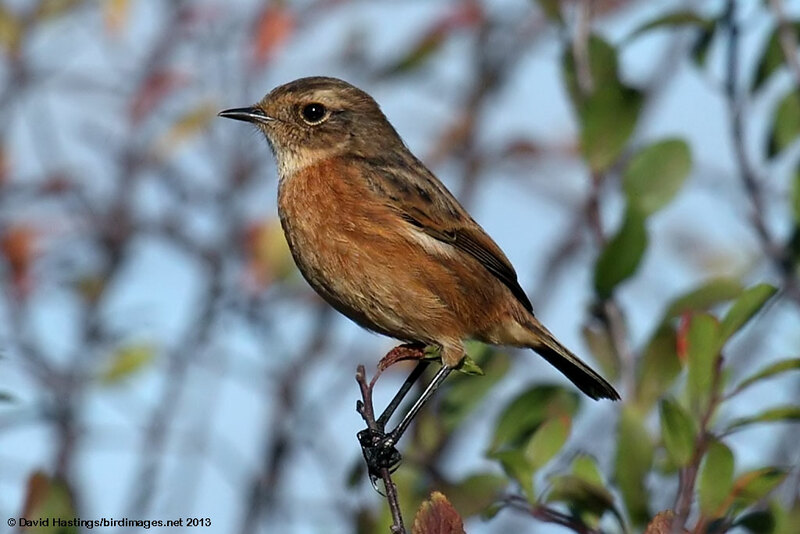 Stonechats breed in open areas with low vegetation, often heather or gorse. They are frequently seen flicking their wings while perched, often doing so on the tops of low bushes. They utter a sharp loud call that sounds like two stones being tapped together. Its conservation status is amber, owing to concerns about the European population. There are between 9000 and 23000 breeding pairs in Britain.